Home / Blog / How to stop travel sickness in my dog? How to stop travel sickness in my dog? If you already suffer from travel sickness yourself, then you will be aware it is not a pleasant experience, and travel sickness in dogs is no different. Summertime usually heralds holiday journeys that can bring on unwanted travel sickness. Like us travel sickness is more frequent in younger dogs and puppies. This is related to development of the ear and how this aids balance, in puppies they are not fully developed hence you see more travel sickness. Most dogs grow out of travel sickness, in the meantime we offer some tips and advice to manage travel sickness in your dog. There are some very obvious signs of travel sickness in dogs, including vomiting and lots of dribbling (more than normal). You may also notice changes in activity levels, so if you dog is suddenly lethargic then this could be a sign of doggy travel sickness. Sounds that you may encounter will include whining and possibly yawning. All of these symptoms are likely to indicate some form of travel sickness in your dog. If you see these signs in a puppy then be reassured that most dogs grow out of travel sickness. How can I avoid travel sickness in my dog? There are some simple things you can do to help make your journeys a little more pleasant for your dog. For starters you can keep the car well ventilated and cool, dropping the window a fraction will help. 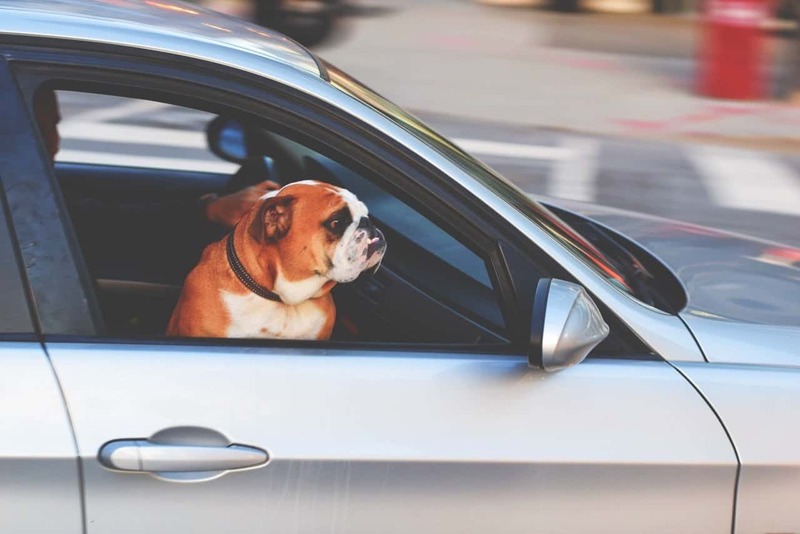 Making the car journey special for your dog can help distract and reduce travel sickness, this can be done using toys that you only ever share in the car, or alternatively using your dog’s favourite treat (not too much as this may further exacerbate any vomiting). If you are finding sickness and vomiting to be a major issue, then think about not feeding your dog for a few hours before you travel. Also consider which mode of transport is making you dog sick, sometimes swapping cars around can make all of the difference. Facing forwards will help reduce the incidence of travel sickness, using a dog seat belt may help with this. Further tips on travelling safely can be found here. Some travel sickness in dogs can be brought on by a stress event, for example a trip to the vets. To help with this and other forms of sickness, getting you dog used to car journeys is very important and should be done gradually. You may even sit in the car with the dog and not go anywhere! Once you dog seems happier to be in the car, go to nice places (like your dog’s favourite park or beach) and reward them for being in the car. Over time your dog won’t just associate being in the car with the original stress event. Finally consider taking a break from the car all together. This may be all that’s needed to help relieve any stress your dog may feel towards it. There are medications to help which we discuss below. As with humans there are different categories of medicines to help alleviate the different elements of travel sickness in your dog. We recommend consulting a vet in the first instance if your dog hasn’t responded to the other tips above. There are medicines that will reduce/stop vomiting, anti-nausea medicines. You can also consider antihistamines, these work by reducing the amount of motion sickness your dog may experience and also will tire or send to sleep. There are prescription only medicines that could be considered should your vet feel them necessary. We hope these tips have been useful! For more doggies related facts and tips subscribe to our newsletter here.